PlantingFields.com, Information on home gardening. "nurturing nature in a man made cradle"," decorating nature your own way"," gardening is the symbiosis of art and nature"," gardening is a natural art"," god creates nature, man decorates it"," go for green"
Gardening is an art which involves growing plants in order to beautify the surroundings. Gardening can be carried out at one's residence or public parks, botanical gardens; theme parks etc. Gardening provides various benefits. A study conducted by American Journal of Public Health has shown that reduced medical costs were associated with gardening. The USDA Zone Map provides gardeners with horticultural and meteorological information about classifying the growing conditions of plants in the United States, Mexico, and Southern Canada. The zone ratings indicate excellent adaptability of the recommended plants to the climate, not just mere survival. Environmental factors are also taken into account, such as wind, soil type, soil moisture, humidity, snow, and winter sunshine, as they affect the adaptability of plants. The map was originally computer-generated by latitude and longitude in cooperation with the American Horticultural Society in 1960 and updated in 1990. The map shows in detail the lowest temperatures that can be expected each year in the United States, Canada, and Mexico. These temperatures are referred to as "average annual minimum temperatures" and are based on the lowest temperatures recorded for each of the years 1974 to 1986 in the United States and Canada and 1971 to 1984 in Mexico. 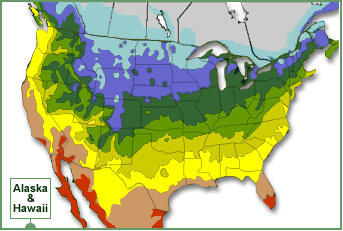 The USDA Plant Hardiness Zone Map divides the U.S. and Canada into zones based on minimum winter temperatures. The higher the number, the warmer the zone.Your trees and shrubs should be cold hardy in your climate--otherwise they may freeze to death and leave an unwanted hole in your landscape. USDA zones don't consider such factors as humidity and rainfall. Thus a plant that thrives in the Arizona desert will likely perish along the humid southeast coast--even though both are in zone 8. In the West, many gardeners use a 24-zone system that considers rainfall, elevation and marine influence. Unfortunately, there's no similar system in the East--you have to rely on local knowledge. Microclimates in your yard can make it warmer or colder than its USDA zone indicates. For example, the sunny south side of your house is typically warmer in winter than the shady, wind-driven north side. You could grow plants from a warmer zone on the south side but you might need plants from a colder zone on the north side. © 2019 www.plantingfields.com, All rights reserved.